AMSTERDAM, NETHERLANDS (February 2011) - The Tommy Hilfiger Group, owned by the Phillips-Van Heusen Corporation (NYSE: PVH), announced the return of Tommy Hilfiger live in Amsterdam. 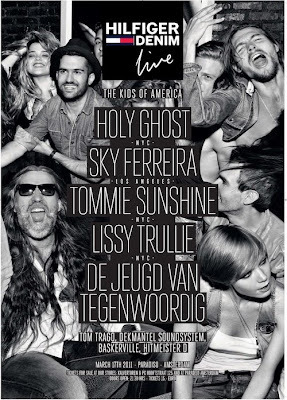 The event, on March 17, 2011 will take place at the Amsterdam venue Paradiso, says the launch of the new Tommy Hilfiger campaign for spring / summer season of 2011: Kids of America. The campaign shows new multimedia talents - musical artists, bloggers, promoters, producers and DJs - some of which will play at this annual music event in Paradiso. Hilfiger Denim Live is a combination of local and emerging American artists and famous DJs. The stars from the Kids of America campaign occur among others the New York DJ duo Holy Ghost, remixer, songwriter and DJ Tommy Sunshine, singer / songwriter Lissy Trullie and American pop sensation Sky Ferreira. In addition, other performances are held, including Youth of Today, DJ, producer, remixer - and born in Amsterdam - Tom Trago, the electrofunkduo Baskerville and DJ Hitmeister D.
On http://ad-emea.doubleclick.net/clk;236735199;60338997;d visitors on the website can meet the Kids America and buy the outfits of the stars of the campaign now. Further is there a contest to win tickets for the concert of Kids of America at Paradiso and a night in an Amsterdam hotel.